The GLORY OF THE LORD shone around them … GLORY TO GOD in the highest, And on earth peace, goodwill toward men – Luke 2: 9 & 14. 1. Can we know when Jesus will return? Of the end times our Lord warned: “And unless those days were shortened, no flesh would be saved; but for the elect's sake those days will be shortened” – Matthew 24: 22 (NKJV).2. Can we know precisely when Jesus was born? “But when the fullness of the time had come, God sent forth His Son, born of a woman, …” – Galatians 4:4.On both issues there has been a great deal of conjecture and confusion. The simple answer to both questions is, “We don't and can't know.” As to the exact time of His birth just do a few Google searches and you'll discover all kinds of reasonings, ramblings, even rantings based on astronomy or religious history or even on the Jewish feasts. The eastern and western Church use different calendars so they arrive at different dates—December 25 and January 6 or 7. Undoubtedly neither is correct, but does it matter? One Jewish based calculation that I read arrived at a very precise date and time September 11, 3 BC between 6:15 and 7:49 pm. Others are not so precise yet argue for a date in September or October, without clearly specifying the year. Maybe they are right but personally I find most of the arguments lacking in substance, convoluted and unconvincing. Again I ask, “Does it really matter?” Are we missing something in all of this? The Bible is perfectly clear about many things—important things; but not so clear about other things—unimportant things! We are told that the “secret (hidden) things” belong to God and we are responsible in respect of the things that are “revealed” i.e. made known by God to us:The secret things belong to the LORD our God, but those things which are revealed belong to us and to our children forever, that we may do all the words of this law - Deuteronomy 29:29. So in respect of the birth, life, death, resurrection and return of Jesus (Yeshua) what are we told to do and what things are left hidden i.e. without binding obligation either way? We are commanded to REMEMBER Christ's Death in what we call Communion - And He took bread, and gave thanks, and broke it, and gave it to them, saying, This is my body which is given for you: do this in remembrance of me - Luke 22:19 cf. 1 Corinthians 11:24. Christians do that collectively often weekly, sometimes monthly and I have even heard of some who do it daily. Matthew tells us that it was “as they were eating” the Passover that Jesus instituted this memorial feast, which is the only “feast” that Christians are commanded to keep cf. 1 Corinthians 5: 8. We must beware and steadfastly reject every attempt by Messianic Jews to Judaize the Church by reintroducing the keeping of any of the feasts of the Old Covenant. Christ Himself is the fulfillment of them all. He Himself is “our Passover” cf. 1 Corinthians 5: 7. What He does when He returns is His business. We are encouraged to watch for and eagerly anticipate His return to this earth – And as it is appointed for men to die once, but after this the judgment, so Christ was offered once to bear the sins of many. To those who eagerly wait for Him He will appear a second time, apart from sin, for salvation – Hebrews 9: 27-28 cf. Mark 13: 32-37 etc. Nowhere in the Bible are we told to remember or celebrate the birth of the Lord Jesus (Yeshua) Christ. Nor are we commanded to celebrate Easter in isolation. The resurrection truth is of course an integral part of the memorial feast of communion and in that sense it is celebrated regularly by Christians of all persuasions. So why do some celebrate Christmas and others (mainly Jewish believers) celebrate Hanukkah? Is either or both wrong? No, neither practice is wrong in itself, but we need to recognize that neither is based on a command. It is entirely a personal choice, ... which we should not try to bind on anyone else, in any way. There is no obligation whatsoever. Personally, and I think I speak for others, I choose to celebrate Christmas (December 25) purely out of convenience which I think is what motivated the Christians of the early centuries. It is impossible to deny that there are pagan links with our December 25 (January 7) Christmas. In all probability when the pagans were engaged in their festivities the early Christians chose the same time to fellowship and worship and thus the Christian tradition of celebrating Christmas developed. Some see this as compromise, while others use it where possible and practical as a means of witness (evangelism). For most Christians Christmas is a family time for sharing and considering others and rejoicing in the one indisputable fact – Christ was born, even if we don't and can't know when. However, one thing we do know HE was born uniquely not primarily to live but principally to die. And this is why we as Christians are COMMANDED to remember HIS death.The Lord Jesus Christ was and is unique among all religious leaders and among all men. He came into this world to die and His death has saving significance for all—rich and poor, young and old, men and women and boys and girls. Jesus Christ died for your sins and if you repent of them and honestly call on Him to save you He will do so and this Christmas will prove to be your greatest ever. 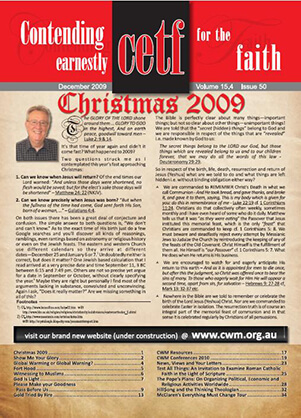 We trust you will enjoy this particular issue of CETF, which is mostly dedicated to a report of the CWM-Conference at Salt in northern NSW, Australia. It's a joy to introduce our reporter Mrs. Jill Jamieson again this year. Our theme was Show Us Your Glory. Next year God Willing as detailed elsewhere in this CETF there will be three Conferences offered – one in Britain; another in USA and a return to Salt in NSW, Australia—September 5-11, 2010. Be great if you can join us at one or more of these events. Happy reading – God bless you – Philip.